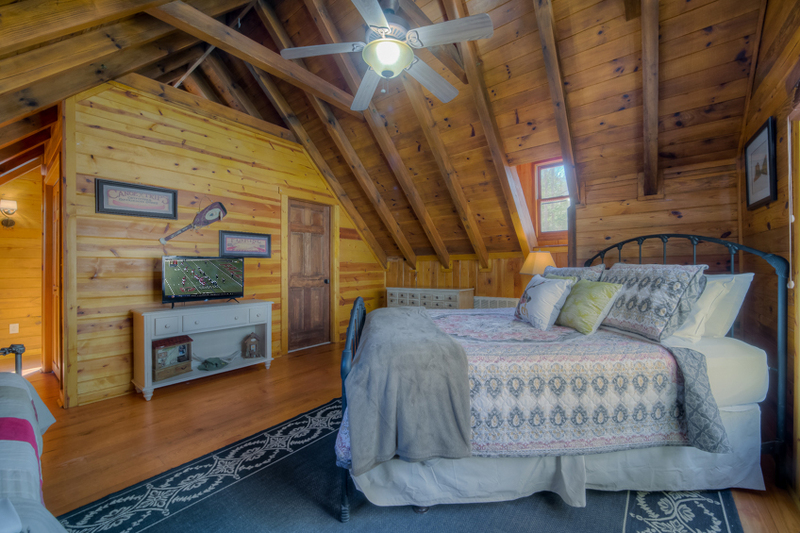 Kick back, relax and just 'Go with the Flow' because this North Georgia cabin rental is the most magical and calming retreat — one that is sure to take you from personality 'Type A' to laid-back and catching up on your Zzz's. 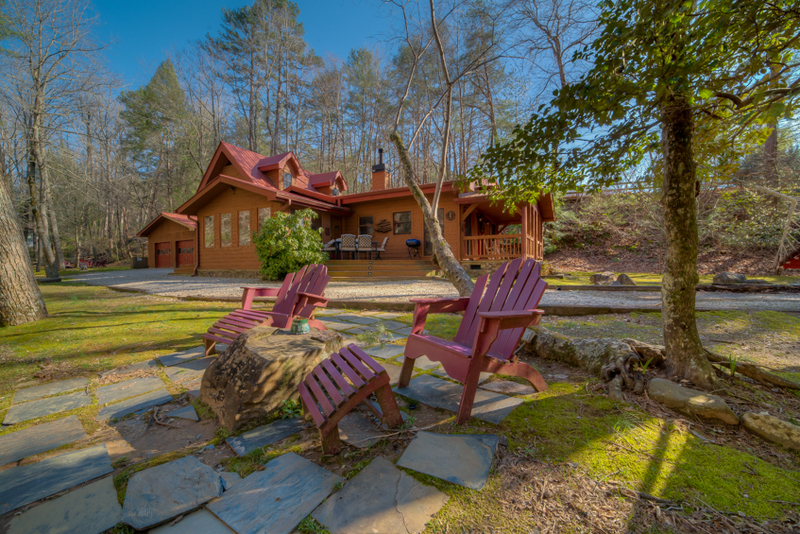 Nestled at the foothills of the North Georgia Mountains this amazing home is on a huge, level lot and less than 20 feet from the Turniptown creek. In fact, you can't get any closer to the calming ripples and soft currents than at this fully renovated, up-to-date home because it was originally built in the 1940's when laws allowed homes to have much closer water frontage. Now, back to the future, 'Go with the Flow' is a present-day dream. It is an all-wood cabin with a red tin roof. The pristine location will inspire nostalgia of the simple joys of days gone by. 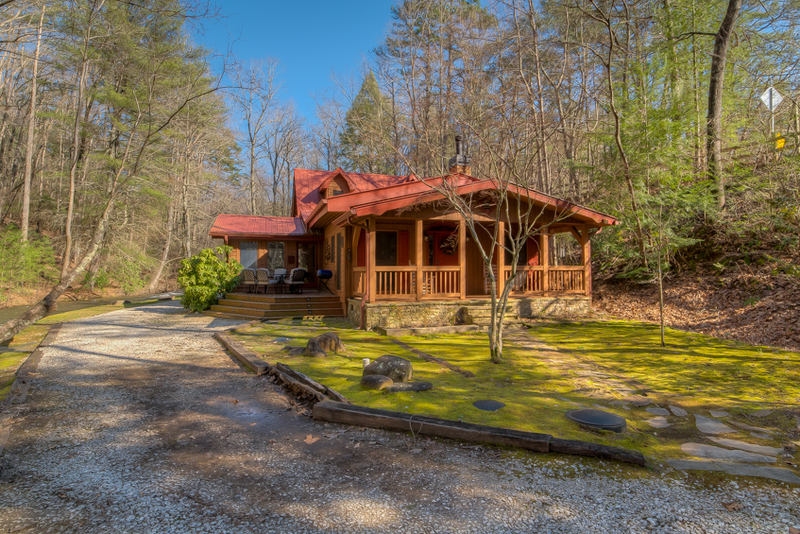 It will also help you to create new memories because this home is just a hop-skip away from many walking trails and three beautiful lakes in the Walnut Mountain area. 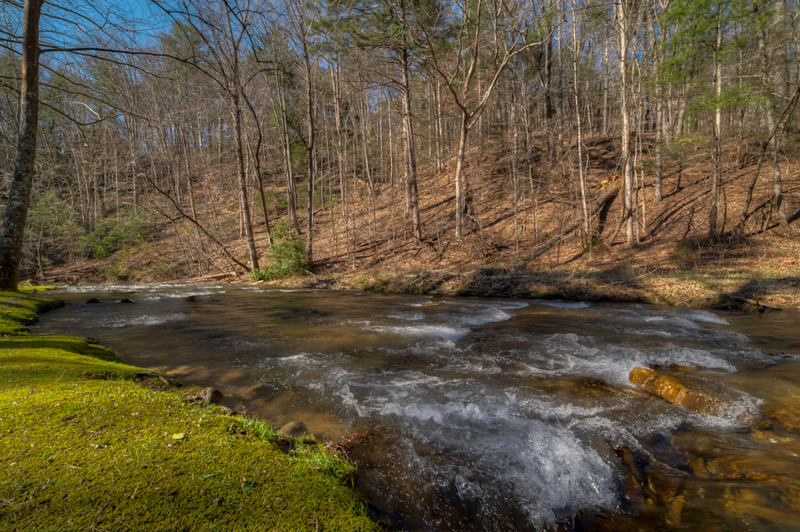 Go with the Flow's property will help you to convene with nature as deer and small furry critters gather in the yard and take pause for some refreshment at the creek. Surrounded by mossy greenery and trees, you will be drawn to several outdoor seating areas like the grouping of Adirondack chairs on the outdoor stone patio placed by the water bank. Let time draw out with a good book and a sweet tea while lounging on the hammock which will soon sway you toward a soothing, early afternoon nap. 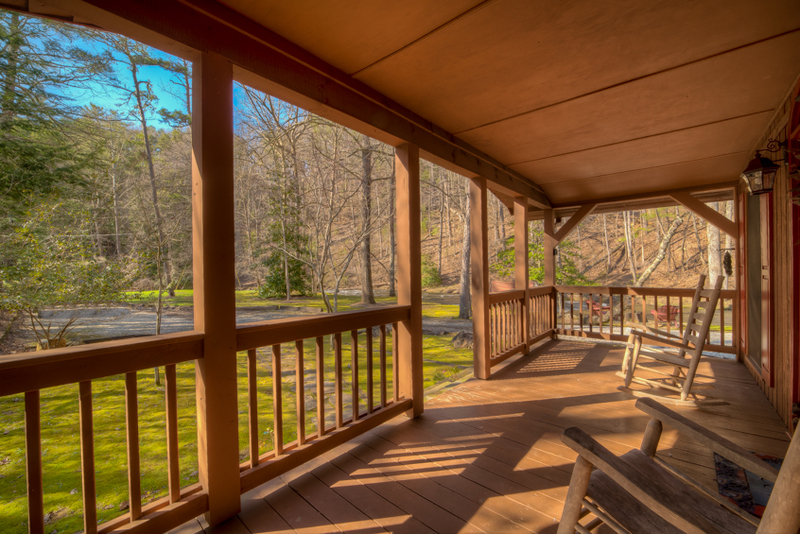 Perhaps you might reconvene with your guests on the front porch, which also faces the creek. There are plenty of comfortable furnishings to continue relaxing while some friends bring out platters of snacks made just steps away in the home's well-stocked, galley kitchen. 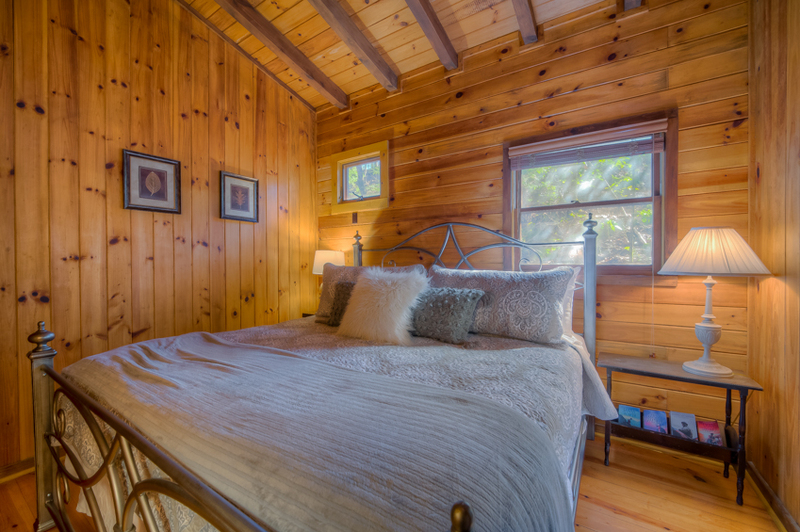 The cabin's all-wood interior is a pure delight and it is cozy, yet airy. It has a living room/dining room combination, outfitted with high-end, casual worn-leather sofas and a hand-carved, over-sized wood table with benches seating up to 12. There is also a kitchen nook table for an additional two at the cafe table. 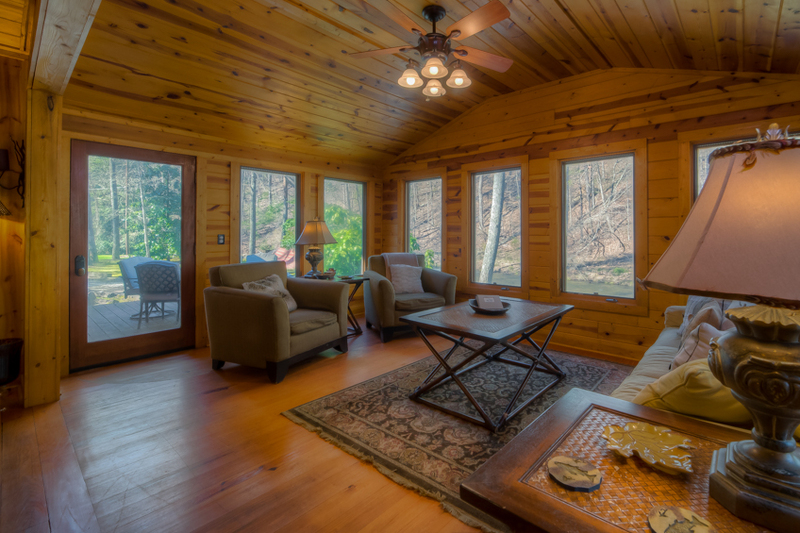 A light-filled sun room is surrounded by nature and has beautifully appointed furnishings for great conversation. 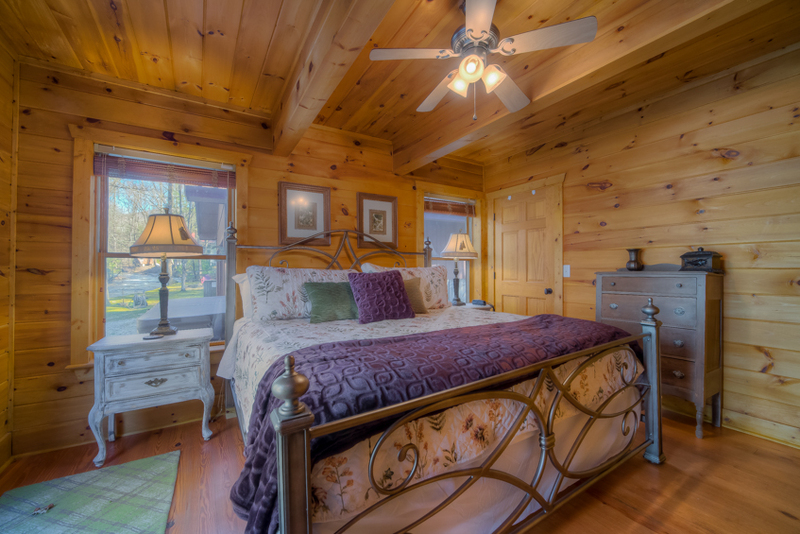 This home's three bedrooms are truly romantic and relaxing retreats. 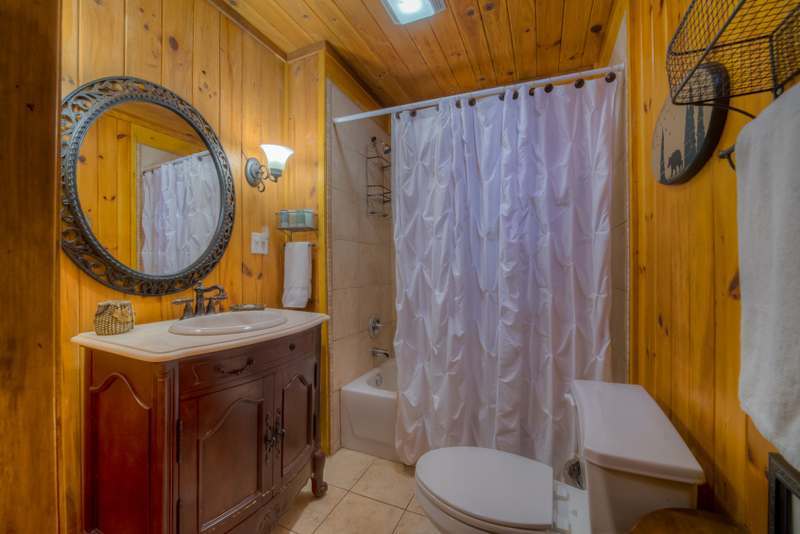 The master is on the main and has its own private master bath, large windows and a glass door leading out to a private porch and a hot tub that look over the creek. 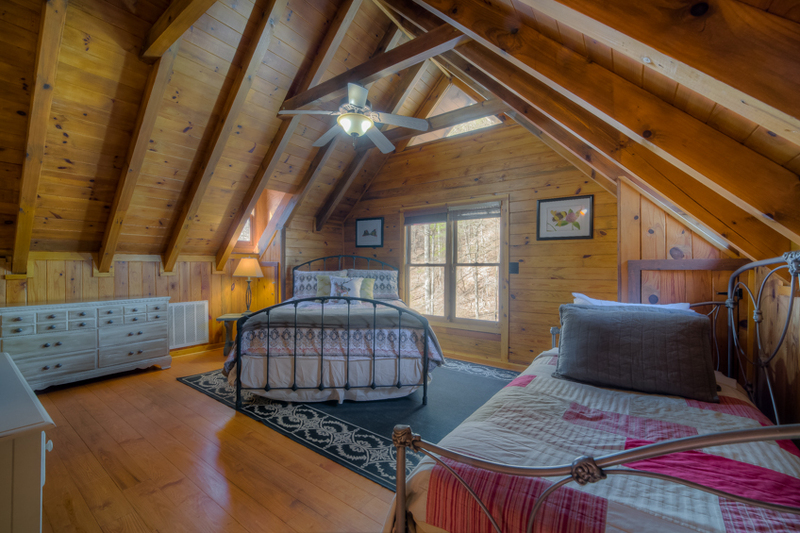 There is another guest bedroom with a bathroom on the main level and a large bedroom/play area with bathroom on the second floor. This is a place where unwinding is unavoidable and where time stands still. Yet, when your vacation is over, it will seem all too short. Relax— Go with the Flow will call you back to enjoy the calm and quiet, time and again. 01/19 - Loved the view and sound of the creek bedside the home. 12/18 - Storybook experience. Unforgettable. 11/18 - Perfect fit for our family. Easy to work with, you all answer the phone when I call!!! 10/18 - The cabin was perfect for our family's getaway. Sleeping arrangements were great. Extremely impressed with Escape to Blue Ridge. We will definitely use again and have already recommended you to some friends. 09/18 - The quietness of the area is amazing, the sound of the creek is peaceful and relaxing. Fantastic, will use again. 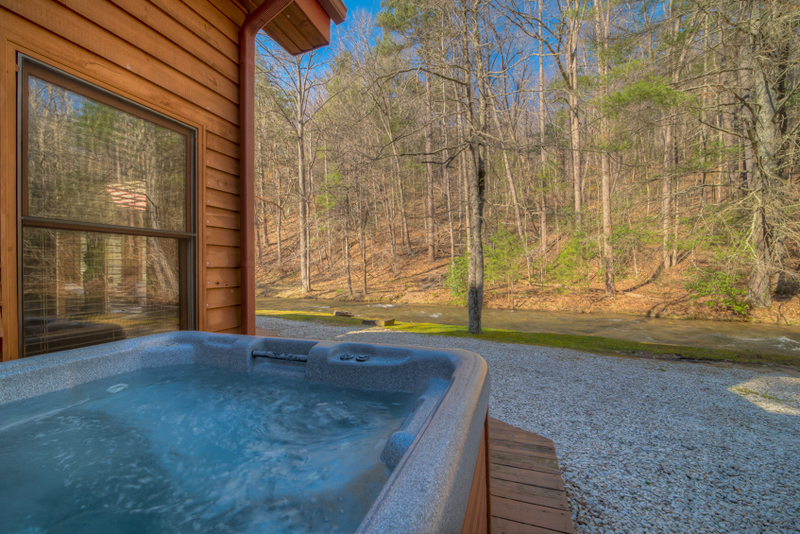 09/18 - Proximity to flowing creek, fire pit, hot tub and the furnishings. Very well run company. Very professional. 09/18 - Wonderful location by the creek. Great company. Very satisfied. 08/18 - The location by the creek was perfect. It was just like the pictures. It was a great place for a family vacation, we stayed outside most of the time. It is also located close to the attractions. Easy to work with. Will use again. 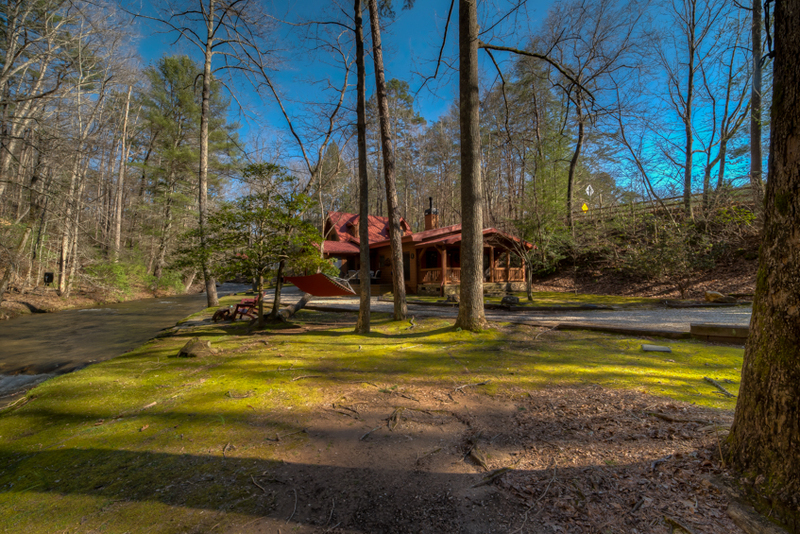 07/18 - Our favorite features of the home were the private creek, ducks with eggs, s'mores by the fire pit, laying in the hammock or kids on the swing! 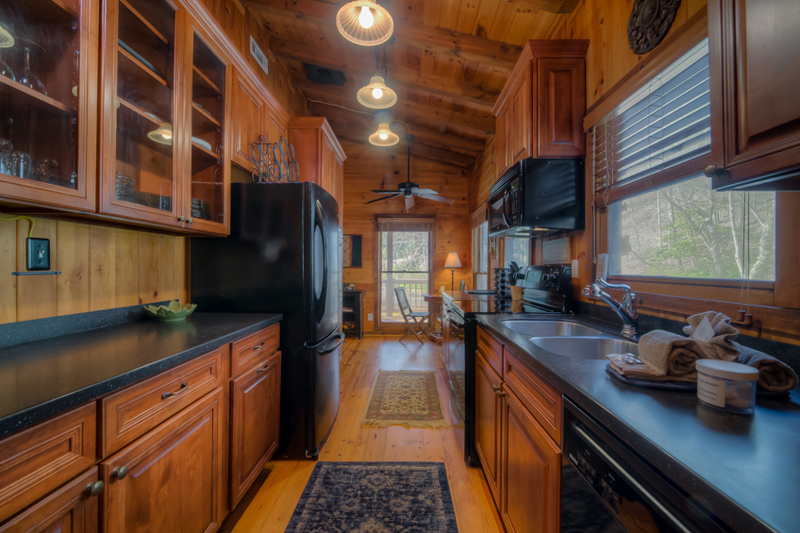 I am impressed with this cabin! We lost power for 2 days due to a horrific storm but plan on returning next year. It was an epic trip regardless of no power. We went on adventures to Lake Winnie Amusement Park and Ruby Falls/Rock City and the Incline Railway. 06/18 - We enjoyed seeing wildlife in their natural habitat, and the creek. I like the quick response from the staff when I book a cabin. 06/18 - this place is amazing. Perfect layout for our family. Having a bathroom in every bedroom was great. We enjoyed the creek, yard and wild life. The resident ducks were a delight. Very peaceful. Friendly staff. Love renting from you. Always responsive. 06/18 - Liked the running stream and the spaciousness and the design of the cabin.VERY friendly staff. I will be renting a cabin later with a view of the valley and mountains. Loved the outdoor space. The river and the fire pit was so amazing and relaxing. 4/18 - The stream and mossy bank out front was beautiful! It was cold out so the hot tub was awesome! We were very impressed! It is a beautiful property and so peaceful. I would highly recommend the cabin and rental agency to my friends and family! This is our second year coming to this house and we just can’t get enough! We already booked it for next year. Any time I called everyone was friendly and helpful. 3/18 - The River is so relaxing and beautiful. Staff was kind, the cabin is so beautiful. 07/17- The location was beautiful and easy to find. Great! 06/17- Enjoyed the swing, love the fire pit and the covered wood pile! We love the company! 05/17- The location by the creek was just perfect. We had a few issues while there and Julia, bless her heart, hobbled out on her crutches to help us straighten out the cable TV, listened to us panic when a tree fell across the creek and the power was out, and helped us find the place when we first got there. The directions were a little confusing. Thanks Julia! 04/17- The cabin is quiet & comfortable. Great job! 04/17- We absolutely LOVED the creek! We couldn't keep our kids out of it! We have nothing bad to say! We only spoke a couple of times to the staff but they were friendly! 03/17- The sound of the creek was amazing. Loved that the only rooms with tv's were the living area and the loft (2 twin beds and a trundle daybed). Lots of room outside to lounge and spread out. About 15 minutes from Amicalola Falls. Love the company. Rented from you before. 02/17- Loved that it was near such a beautiful Creek with a large piece of land. Loved the pre-cut firewood. The house is like something from a storybook! 01/17- The location was fantastic to be so close to a small creek. The home is also situated on a large flat block of land, which was great for the kids to run around. Easy to deal with and our calls were returned promptly. 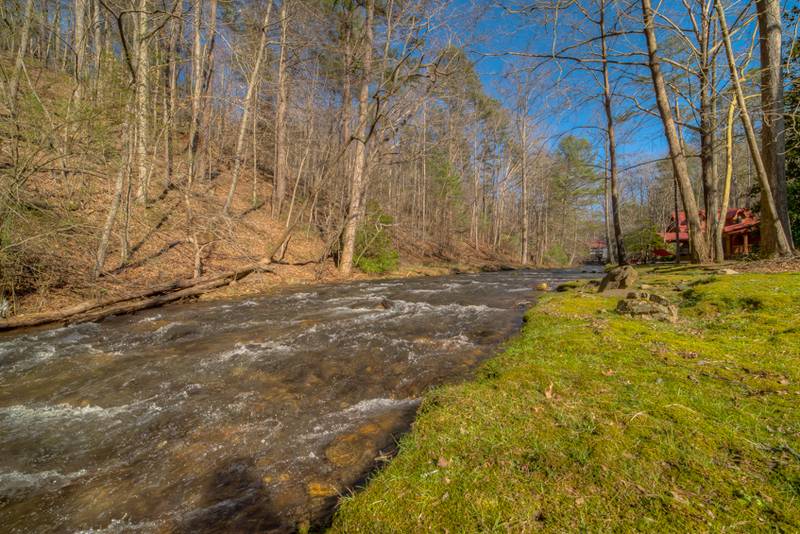 11/16- The creek in front of the cabin provided a wonderful view and peaceful and relaxing vibe. 10/16- The whole setup was great. 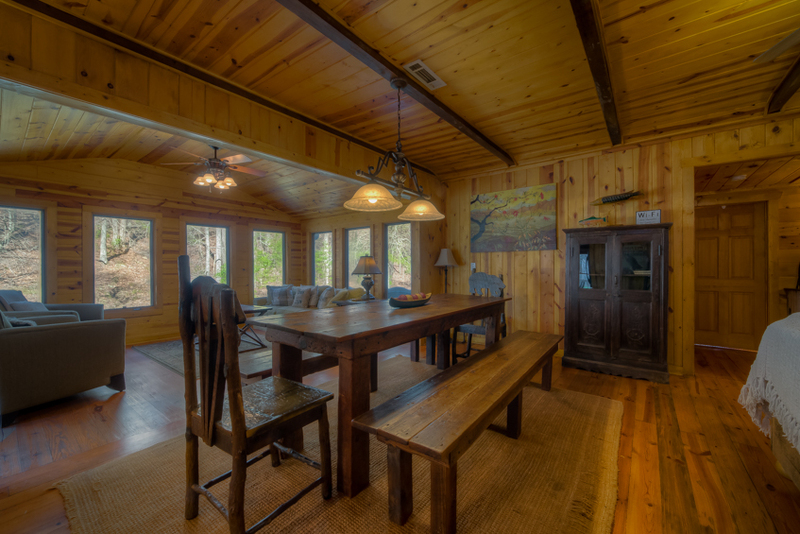 10/16- The cabin was beautiful and spacious. 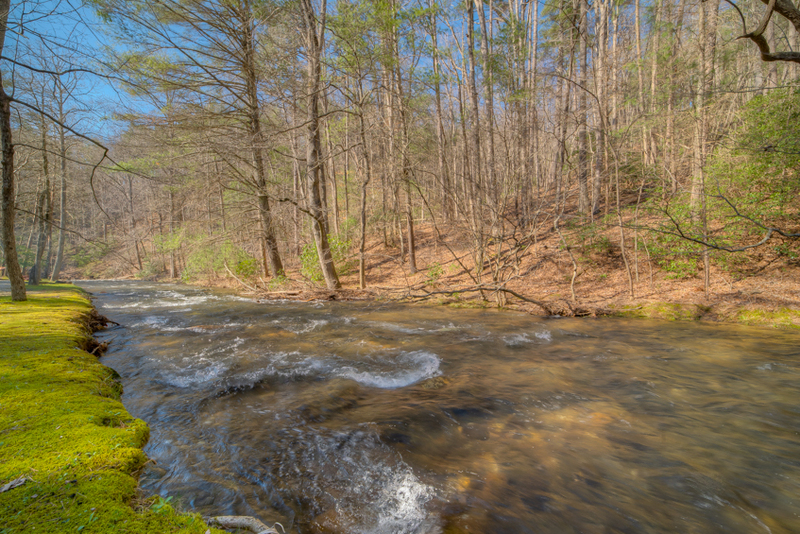 I especially loved the stream that ran beside the cabin. The reservation process was easy and fast. 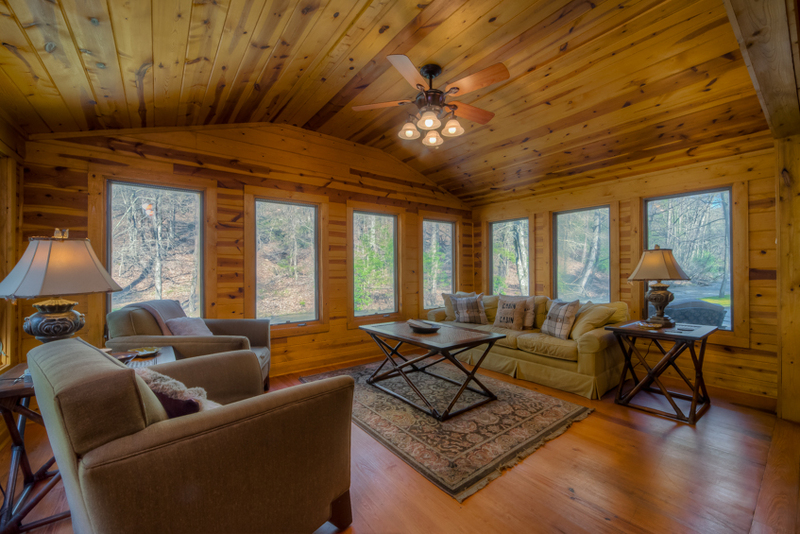 09/16- The spacious living room/sun room and the setting by Turniptown Creek were our favorite features of this home. Outstanding communication and guest interaction. 08/16- The privacy and the creek are excellent spots..
08/16- Our favorite features: on a creek, size, layout, cuteness and peacefulness of house and location. Overall, all was excellent. Loved the house! Responses and immediate information updates were exemplary. Communications were all very accurate and very helpful! We appreciated it all. 08/16- The white sheets and towels and the river access is spectacular. This is an older place but the company keeps it neat and clean. 07/16- The property was fantastic. 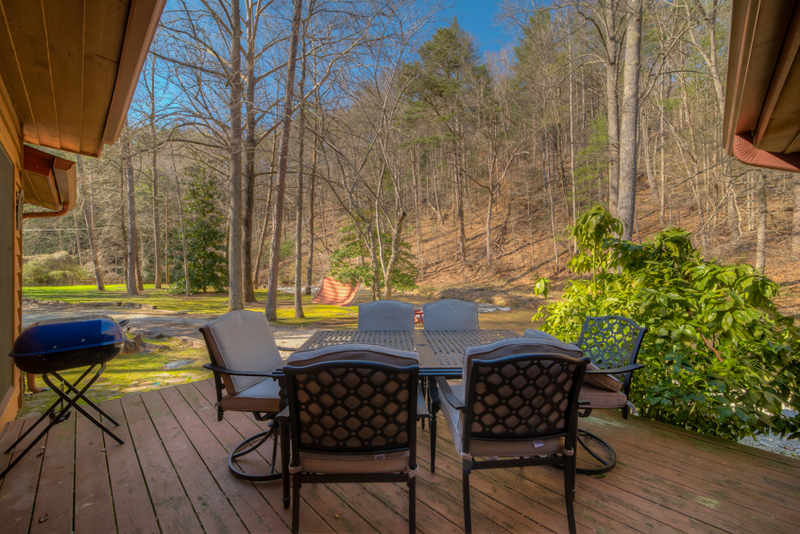 The creek side attributes, fire pit and yard space was perfect for our family with young children. 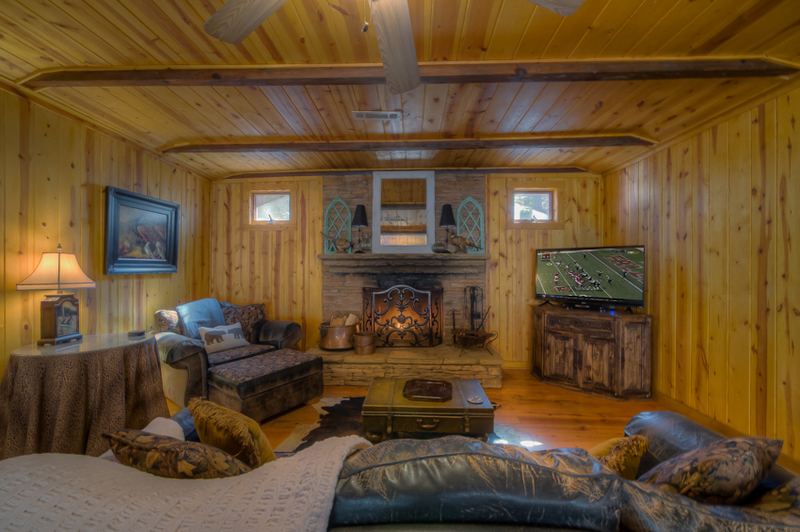 The cabin itself was also very comfortable and accommodating. Very professional and accommodating. The welcome kit and the information binder was a nice touch! Our experience was very good - we'll be back! 06/16- We love the creek and the location and quiet space. 03/16- beautiful, homey, LOVED the river! 03/16- Being so close to creek was awesome. The company was very nice too. 03/16- We loved being close to the water. We had plenty of room and the fireplace was great. It was an awesome trip. We plan on going again next year. 01/16- River right by cabin. Conveniently located within an hour of almost everything. Staff was very quick to attend to our needs. Thank you. 12/15- The best thing about the cabin was the beautiful outside creek. It was a little to cold to enjoy this time. for our Trip and all service's needed. First Class all the way. 10/15- The yard, creek, and private location. Great for kids due to privacy and fenced yard. Would stay with you all again. Excellent. 10/15- This is our third time renting this property and we love it. The creek location. The hot tub and the fire pit. The flat property for my kids to play on. The shampoo was a nice touch. Great to do business with, will certainly rent from you again. 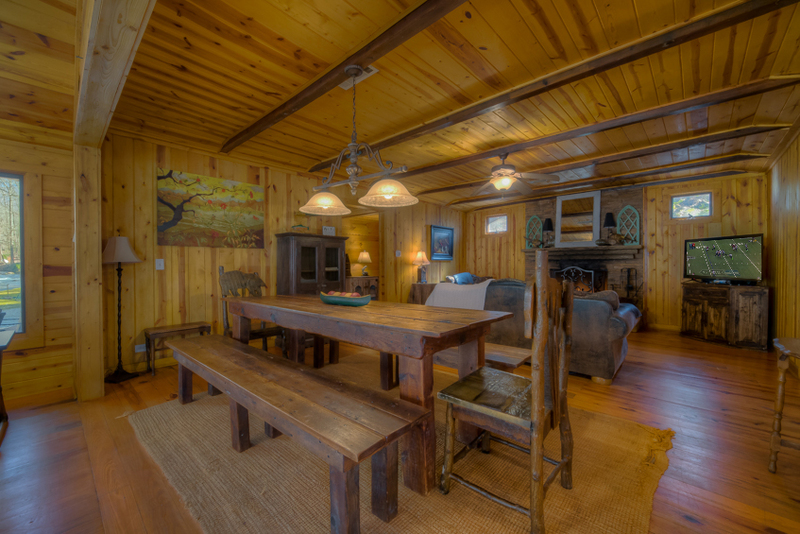 10/15- I love everything about this cabin--the location, the proximity to the creek, the layout. 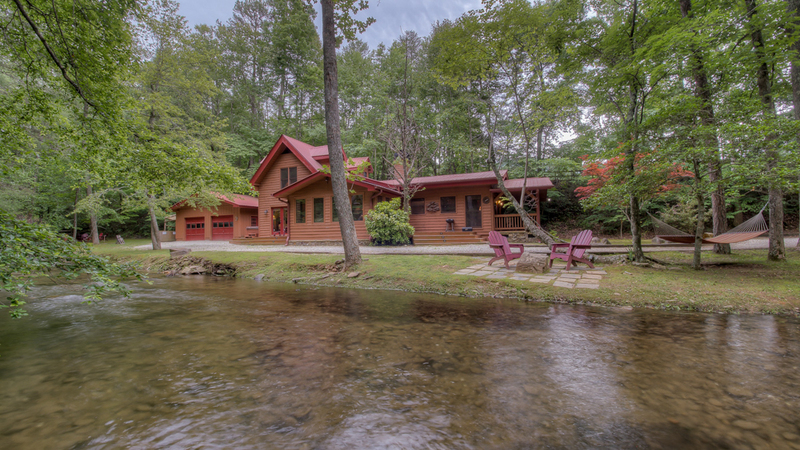 07/15- Very spacious and located on a secluded mountain creek. Staff was always pleasant to speak with and very knowledgable. 07/15- The location next to the creek was spectacular. It was open and spacious. Your company seems very organized. Your communications were clear. We liked the welcome package and the suggestions for excursions on the website and in the binder at the cabin. 07/15- I have two children so the creek was great for them to explore. 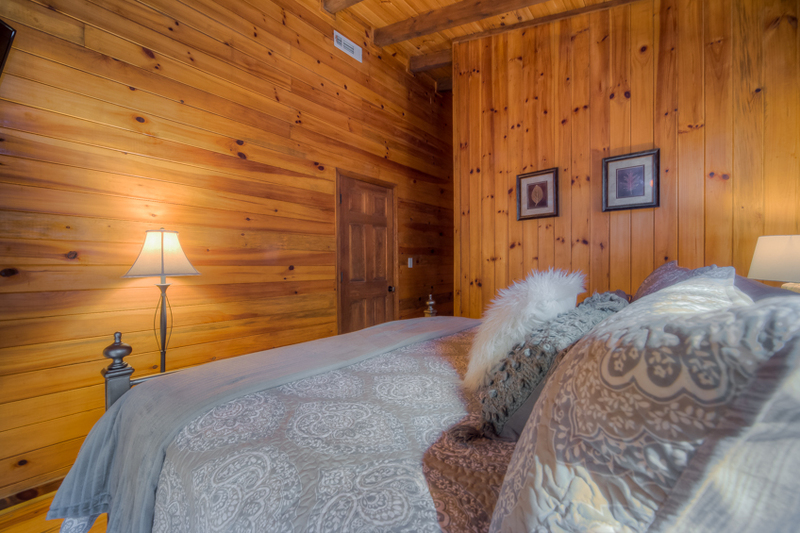 The property is beautiful and relaxing.Very professional and provided great information on the area. 05/15- We loved being so close to the water. 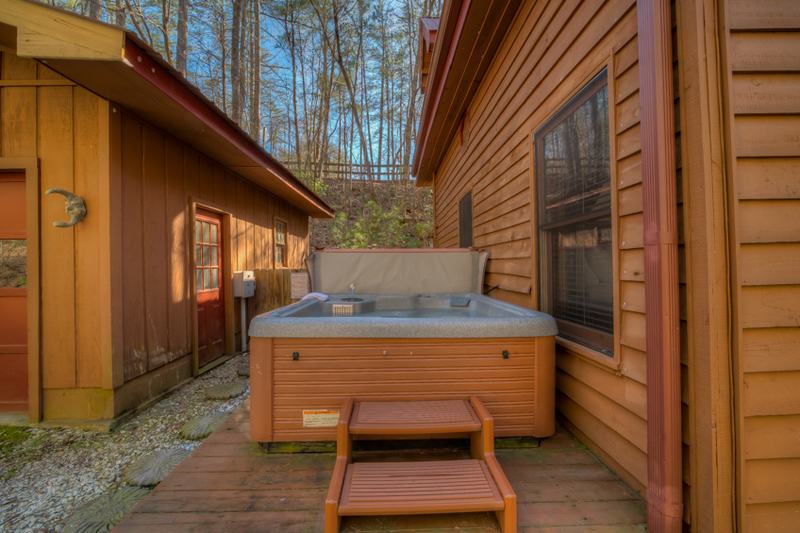 We also loved the hot tub and sitting area next to the creek.The property was represented well from the photos. 05/15- We enjoyed being so close to a creek while at this cabin. 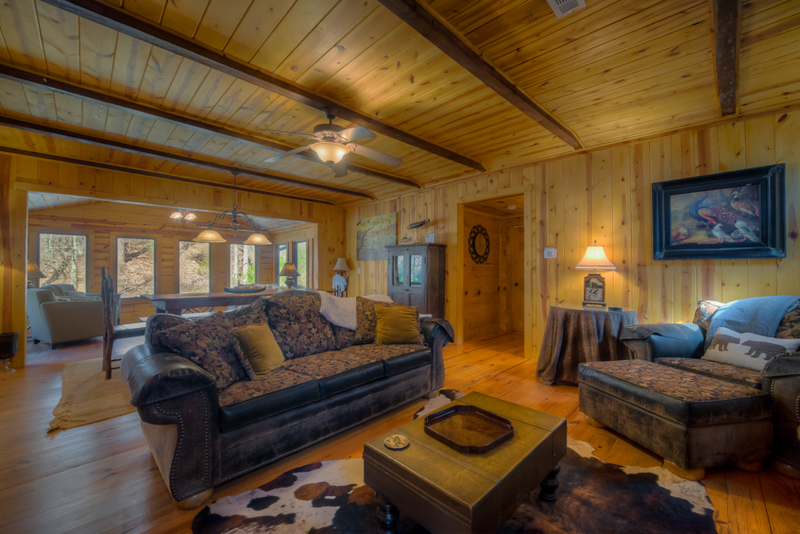 We have enjoyed our many stays at the cabins with Escape to Blue Ridge. 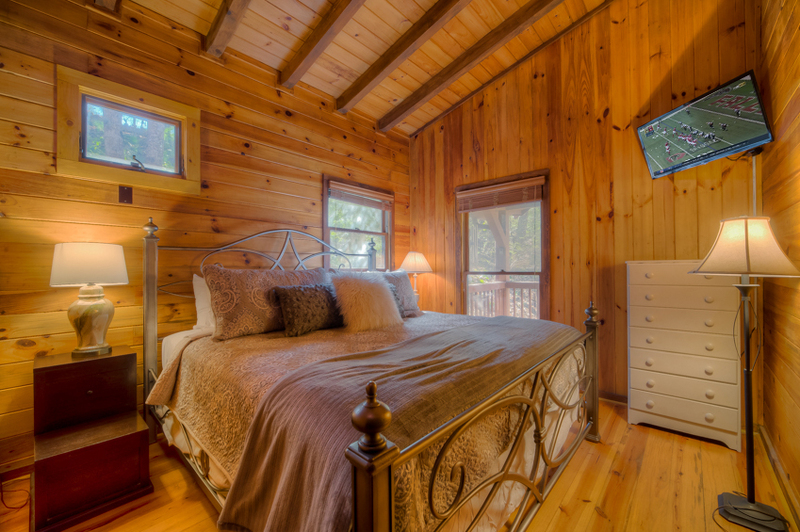 Your website has been accurate in details about cabins and reservations. However, one major improvement to your site would be to list cabins in alphabetical order on the availability calendar. 04/15- Loved that it was right on the creek and set back from the road. Loved the jacuzzi and the fire pit. I loved that there were basic amenities for us, like dishwasher detergent, dish soap and shampoos and conditioners; towels and sheets were comfy; upstairs bedroom was perfect for our kids. 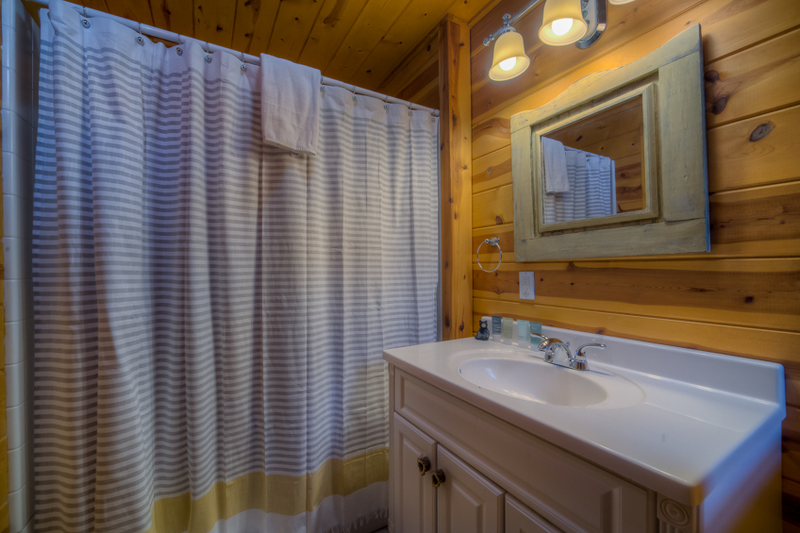 This was my first experience with Escape to Blue Ridge, and the only person-to-person interaction I had was on the phone when I called to find out about which cabin to rent. 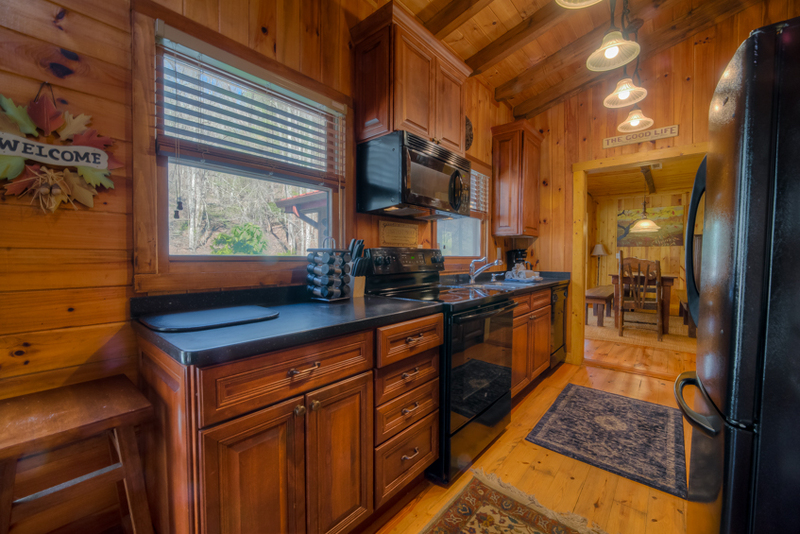 The woman was very helpful, friendly, and we found the perfect cabin for our family. I found helpful brochures and activity planners online and in our welcome package. This was our first visit to the area and I think we'll be back -- we spent the week hiking and staying at our cabin and it was a perfect vacation for us. 03/15- Everything...we enjoyed our stay at Go with the Flow. When I posted the pictures at facebook, almost all of my friends were asking me how did I get to such relaxing place.Of course I did share to them your website. I t was our third time with escape and looking forward for our 4th, 5th and more experience with you guys. 03/15- The location right in the creek was incredible. 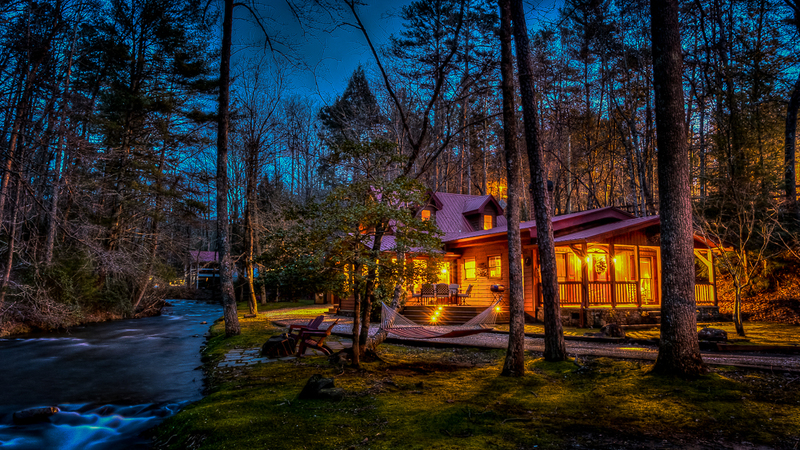 Beautiful cabin, the creek is so relaxing. The layout is great. The decor is perfect. 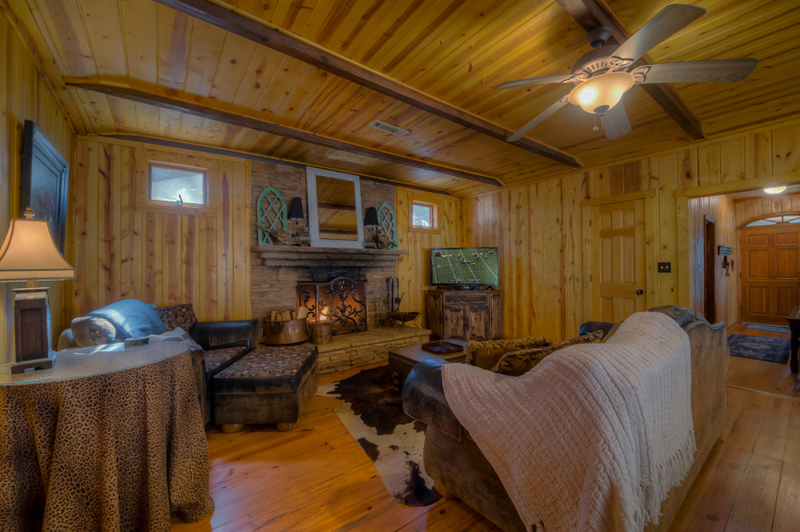 03/15- location, decor, authenticity, comfort were great! I'm very impressed with the professionalism of he company and it's staff over all. We have booked again this Fall and have recommended to several people as well. 02/15- The site is lovely near the creek with a level park like lot. 12/14- Outdoor areas; creek were the favorite features. It was a beautiful setting with awesome accommodations. 11/14- The stream being close by is our favorite feature. Also loved the fire pit outside. 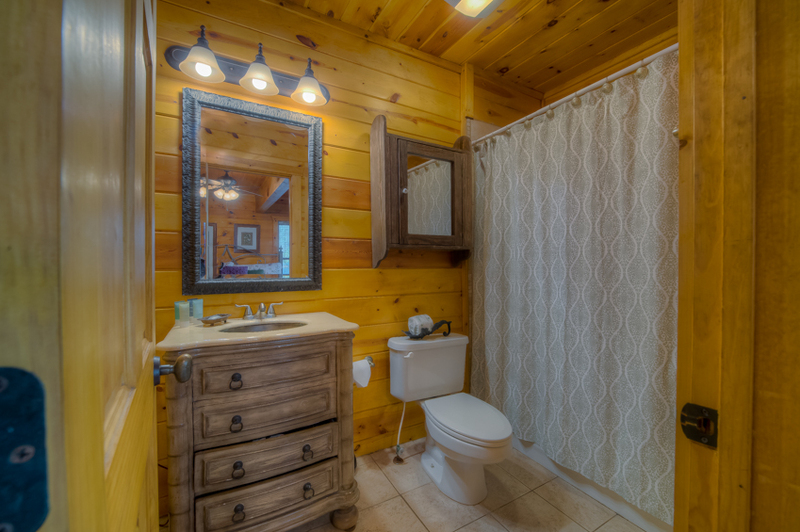 Loved having a bathroom for each bedroom. Pleasant experience. Loved the cabin we stayed in. Would recommend this to our friends. 10/14- Loved everything. 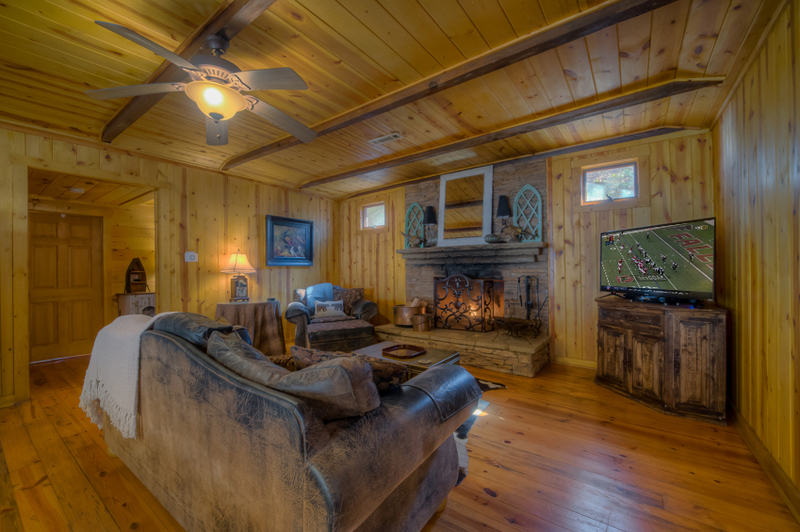 The Cabin is beautifully decorated and the sound of the creek outside just makes it perfect. Very professional company to deal with too. 12/14- We stayed in Go With The Flow in October of 2014. We ended up coming at a great time for fall festivals and to see the leaves change color. The cabin was pretty centrally located to all the activities we wanted to do. We drove to Dahlonega twice, to Burt's Pumpkin Patch, Amicalola Falls, an apple orchard, and went in to downtown Ellijay a couple times. 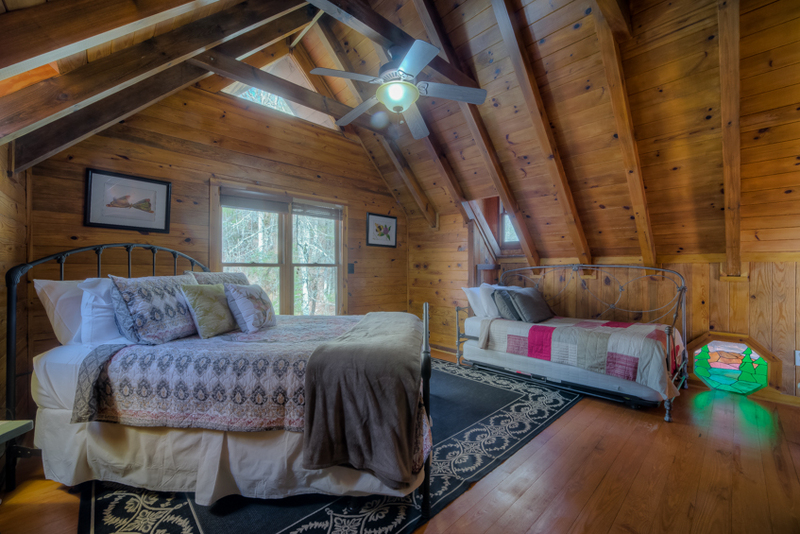 The cabin, which was built in the 1940's, is really, really cute and well-maintained. My family absolutely loved the creek outside. I really enjoyed opening the porch door to hear the running water while we were hanging out inside. We took advantage of the hot tub a few times as well. We only ate out a few times and cooked most meals at the cabin. The kitchen was well-equipped to cook whatever we needed. They even have marshmallow roasting skewers, which we didn't discover until we bought our own. The installed microwave is broken, but there is a working one on a small breakfast table in the corner. Hopefully they will fix this soon to make things a tad nicer. Overall great place! 10/14- The home in general were our favorites and especially the stream right outside. 09/14- The stream and the interior of the house were our favorite features! 07/14- The sunroom area was bright, inviting, and comfortable. 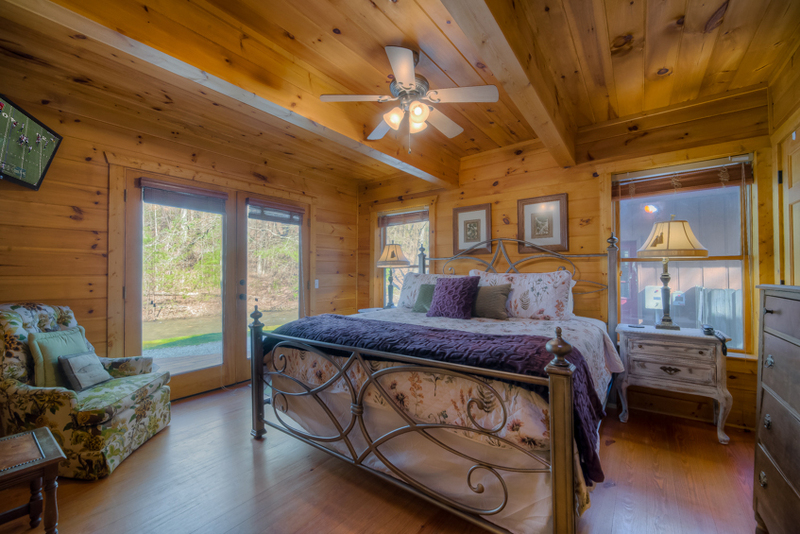 With the windows open we could nap or read a book to the sounds of the flowing river. We also loved the long, flat lot on which the cabin sits. There was plenty of space to safely explore the river, having the fire pit and another seating area far apart was perfect, and our son who uses a walker due to a physical disability was able to enjoy all aspects of the river, yard, and fire pit. Our two kids spent time playing in the yard and on the rope swing. The river was the highlight! Shallow enough to see a fish or two but deep enough to wade in almost up to my knees. Inside, the kitchen was well equipped and the beds were very comfortable. Go With The Flow is awesome. 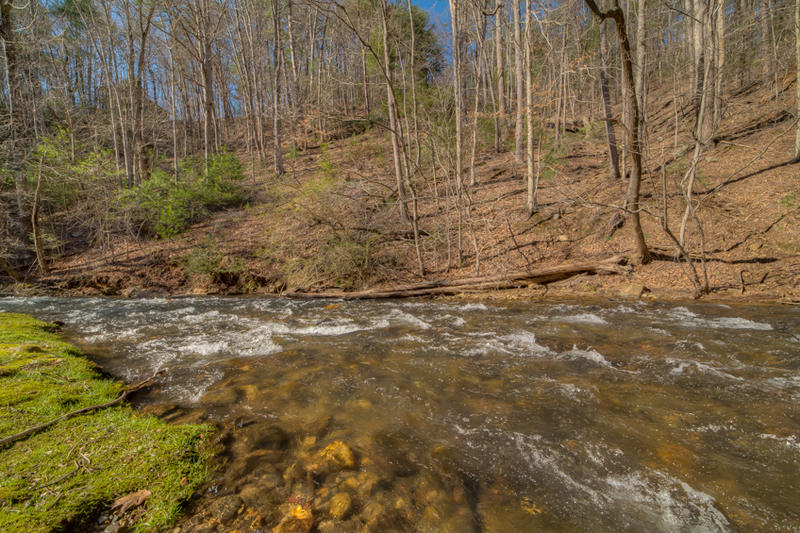 The location is perfect with the stream flowing right out your back door. We saw and fed a couple of trout in the stream and watch a doe cross one afternoon. 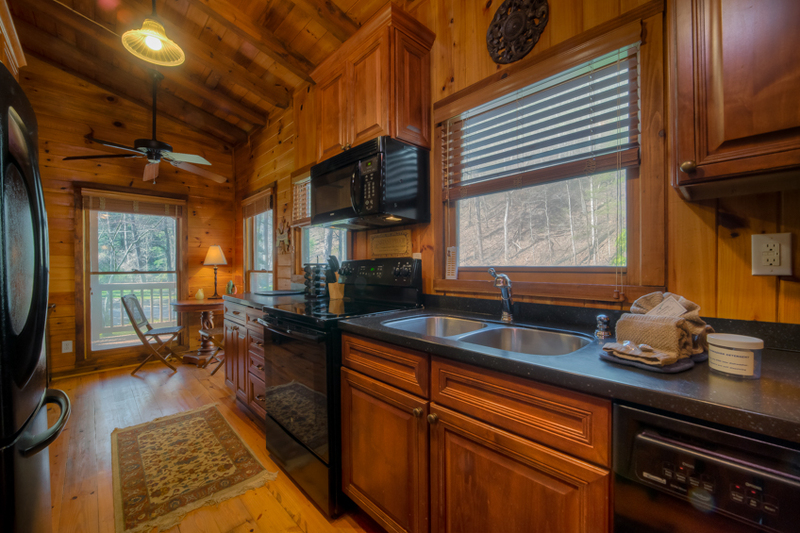 I highly recommend this cabin...it is very close to the beautiful Amicalola Falls and close to other nearby waterfalls and trails as well.